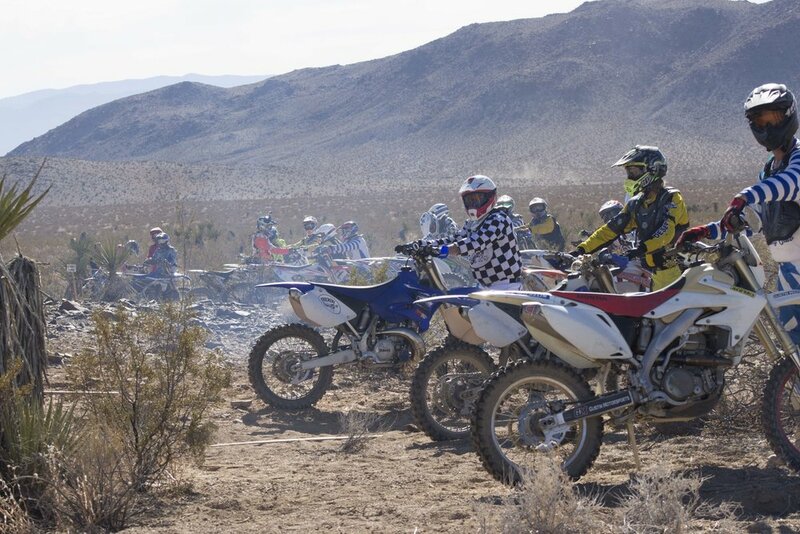 Several clubs united to put on the Riders Helping Riders Dual Euro Scramble in Johnson Valley OHV as the last desert race of the 2017 season. 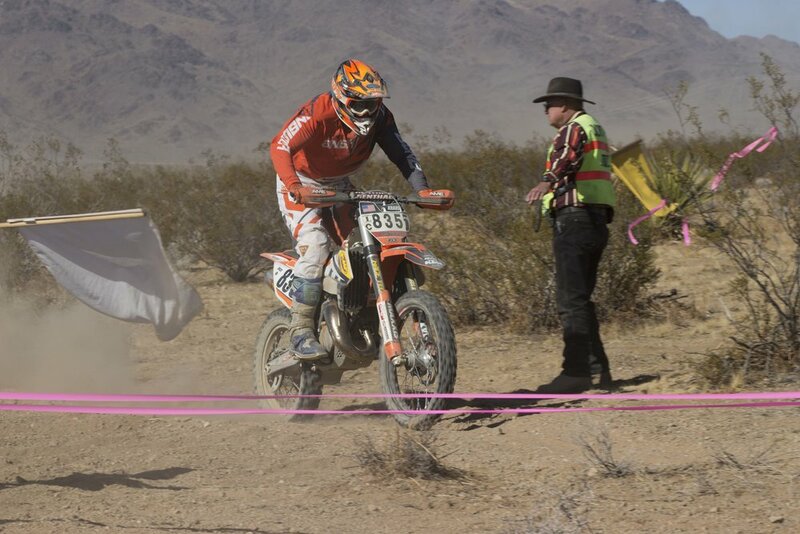 HBMC, Desert MC, Lost Coyotes, Checkers MC, 100’s MC, and the members of Riders Helping Riders made sure that this race was not only awesome for the racers, but also for the spectators. With course A and course B being within walking distance of one another, you were able to see both starts take off at the same time! A start line that differed from your usual desert race, the riders had to watch the banner drop while off of their bikes! A Le Mans start was interesting to watch and only put up a challenge factor for these racers. Anyone who attended this year’s event is sure to be back for next year! The first races of the day were Mag (50)+ Exp and Sen (40)+ Exp on course A, while Legends (70+), Masters (60+), and all Women and Mini raced on course B. Paul Krause stole the show in the first race of the day coming in 1st with a lead on Brandon Wright in 2nd. Meanwhile, on course B, the Olivas girls were having a nice battle of their own, per usual, as Kari Erickson finished her race day early due to an injury. 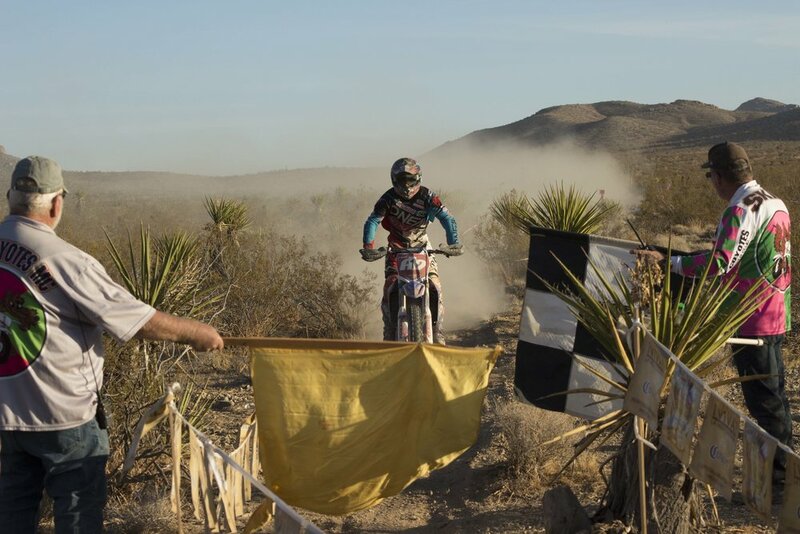 Taylor Olivas was able to pull the win for that race in the Women’s class. The second batch of racing for the day saw all Vets (30)+ HWT, and 250 200 Nov/Beg on course A. The first racer to come through the first lap was Brandon Wright with Kyle Erickson in 2nd and Brandon Tipton in 3rd. Knowing that Erickson was close behind in 2nd, Wright overcame the pressure and held 1st place position the remainder of the race, being the first to see the checkered flag. Kyle Erickson came in a close second with Brandon Tipton in 3rd. The next race to occur on course A was HWT, 250, 200, Exp/Int. After battling I️t out with Zach Spano off of the bomb, Ryan Smith was able to hold the leading position the entire race. Favoring course A because of the mixture between fast and slow sections, Smith was able to fight through this race, after racing EnduroCross the previous day and pull off 1st place position in race 1. Zach Spano was not very far behind in 2nd place, with Paul Krause in 3rd, who also raced the first race of the day! Maverick Shuey came in 4th OA, taking home the Lightweight 1 win for that race. Seeing another win from an Olivas girl, the seventh race of the day put on a battle for the Women's class between the sisters. Taylor Olivas taking the 1st place position just in time to get through the scoring chute was not able to hold her lead for long before Laci Olivas stole it from her! Laci held the position and finished her last race of the weekend in 1st place with Taylor Olivas behind in 2nd. Taking home his second win of the day, Paul Krause went out for the second Mag (50+) Exp and Sen (40+) Exp race on course B. Coming in 1st place ahead of Brett Hoffman, Krause had already had a day jam-packed with racing. Paul Krause crosses the line. Photo: Kaeley Porter. The very last race of the day saw the HWT, 250, 200, Exp/Int. On a course that was more beat up from previous races throughout the day, course B had an unexpected leader off of the first lap. After having a poor start, Ryan Karell was able to make up for it by battling his way up to the lead in no time. Through the insane amount of dust, he was able to pass Ryan Smith and a few others, coming through the first lap in 1st place. Behind Karell, Zach Spano fought for 2nd place while Paul Krause's race ended within the first lap due to an injury. Seeing the checkered flag first was Ryan Karell, with a well-earned 1st place position.